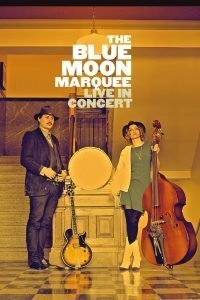 Stemming from the Badlands of the Rocky Mountain prairies, Blue Moon Marquee is a self-styled gypsy blues band.This authentic duo writes and performs original compositions influenced by early blues, swing, and ragtime. A.W. Cardinal, a Metis of Cree heritage, howls with a distinctive thick and smoky vocal while playing a jazz tinged blues guitar. Jasmine Colette, aka Badlands Jazz, is the rhythm section who not only commands the upright bass but also keeps the swing with both feet while singing harmonies. Blue Moon Marquee’s passionate performances and smouldering onstage chemistry is their trademark, and the way Colette’s honey tones lift A.W.’s beaten down “bukowski-esque” mystique is something that enthrals audiences from the back room bar to the public square.